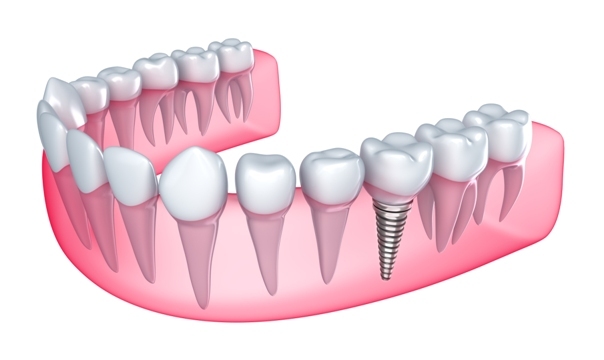 Dental implants are the most comprehensive solution to tooth loss. At Fair Oaks Family Dental, our specialists provide both dental implant placement as well as restoration construction and attachment. Improve your quality of life with a dental implant-supported restoration from our experienced Pasadena dentists. How are Dental Implants Beneficial? Dental implants provide benefits beyond purely cosmetic restoration because they replace the entire tooth from root to crown. Implants stabilize the jaw. The bone in the jaw can diminish after tooth loss. Traditional restorations rest above the bone and do not prevent bone loss. Implant posts are placed into the bone and become the new tooth roots, providing stimulation so that the bone continues to grow and develop. Implants are permanent and will last a lifetime with proper care. Dental implant- supported restorations feel and function like natural teeth. Implants are more comfortable. Traditional dentures can slip and irritate the gums, but implant supported dentures stay securely in place. They do not require adhesive paste or irritate the gums by rubbing against them. Because dental implants are inserted into the jaw, they can be used to support any type of tooth replacement option. Dentures, partial dentures, bridges, and single crowns, can all be created with the added stability of a dental implant post. After your implant has been placed and your healing process is complete, your new teeth will be fabricated at a professional dental laboratory. Then, we will place the restoration on top of the implant, making sure it blends in perfectly with the surrounding teeth. If you’re looking for superior permanent tooth replacement, reach out to Fair Oaks Family Dental. Our team of dental restoration specialists will work closely with you to determine your best treatment option. We will assist you through the whole process, from implantation to restoration. Call Fair Oaks Family Dental and schedule a consultation today.